If I am honest (and honesty is something I try to prize) I would have to admit that this has not been my favourite year. I am left looking forwards to the next, although the slow advancing of the years does not fill me with pleasure. 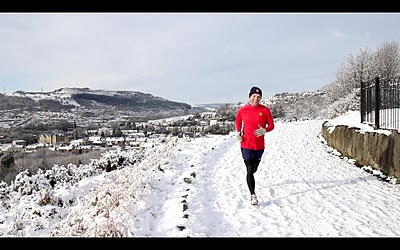 Still, on my personal to-do-list there are items as yet un-checked, and so this year's picture fittingly finds me racing through the snow, unbound, unfettered, a smile on my face and ready to achieve those things I have not yet managed. Age is a reminder: we are granted one life. Live it well. Don't waste it. Make good choices, and (in the words of Winston Churchill that I have on a fridge magnet) - "Never, never, never give up". The Church of England is about to decide on The Covenant, the new arm of anglican unity, or the end of anglicanism as we know it - depending upon your standpoint. Personally, on the whole, as an anglican evangelical, I am very much against it. We have the catholic creeds. We have the thirty nine articles. We have the prayer books. And we have a history of understanding that the church is a big place, and that within its walls we will all fall out with each other but still belong to Jesus. I'm not sure why we think a new document (regularly updated to reflect the latest fads in ethical or theological infighting) will help. All it will do is help point out what those fads are and what the factions are that are enjoying the fight. Hardly the stuff of John 17, is it? O, it's possible that one side or another may enjoy the odd 'victory', but I refer you to my previous sentence. Now: my conservative evangelical friends are having apoplexy, and are beginning to write their comments already - how unevangelical I sound, how cheaply I am selling our scriptural heritage, how easily I abandon the importance of doctrine which the covenant will help us preserve in these dangerous days. The Covenant will be re-written at regular intervals, by the predominant party of its day. If the evangelicals are feeling powerful today, they should remember it's barely twenty years since they were all but non-existant, and perhaps wonder what the Covenant would feel like if re-drawn in such circumstances. It's a flexible tool. To make the majority feel good, and to whip into shape the recalcitrant few. It's ecclesiastical bullying. Hmm. Blessed are the meek, anyone? Sorry, just for a second I forgot to sell my scriptural heritage cheaply enough. As Anglicans, we have never set our store by the mass acceptance of secondary theology - adiaphora. We have held to the old adage of in things essential, unity; in things inessential, liberty; and in all things, charity. The Covenant seeks to firm that up a little... or rather, to take away a little liberty. And charity. Gordon Brown would like it, I suppose, as long as he was writing it. It suits the spirit of an age where the powers that be want a little less freedom around the place. But wasn't it for freedom that Christ has set us free? Sorry. More Scripture interfering again. As an evangelical, I have to trust the power of God through his Spirit at work in the believer's heart, and the love of Christ transforming each believer, and the inspiration of the Scriptures conforming us to the character of Jesus as we seek to know him more. As an Anglican, I have to accept humbly that I am not the only person in the big house of faith and that (occasionally) I will learn something of my Lord from my brothers and sisters around me. It seems to me that God in his mercy did not require his Son to say during his earthly ministry - "O, and by the way chaps, unless you all agree on absolutely everything at all times, I think you should form a committee so that you can throw out those you don't much like". Though I do recall St John saying words to the effect of, "Hey kids, come on, play nicely now." There we go. That'll do. I'll sign up to that. If we're going to add to the Catholic Creeds, the Thirty Nine Articles and the Book of Common Prayer as the formularies of the Anglican Church, let's just add 1 John 3.18: "Hey kids, come on, play nicely now." Yes, I confess. I had a couple of long journeys to make this week, and being of a certain age I bought the Take That CD. The one with all five of them. I mean, the opening track is the single, and it is musically very interesting - but if anybody has the foggiest idea what it is actually about, I'd love to know. And then it gets opaque after that. There are a couple of tracks that I quite liked, and I sort of felt I might be a "grower" - the kind of CD I'd like more if I lived with it for a bit. After all, some CDs you buy & love on first listening soon cloy & get boring. This could be the opposite. Then I got to the final track. Eight Letters. For the first time I had to replay a song straight away. "Eight letters, three words, one meaning." Anyone who feels that pop songs lack intelligence in their lyrics needs to listen to this. All tracks on the CD are credited to all five blokes, but they've been studying Stephen Sondheim to come up with this one. And what was the question and why was the lesson so deafening?" Goodness. Anyone who has gotten just a little bit older and hasn't felt that hasn't spent their youth well or learned the smallest mite of self-awareness as they aged... But to hear it spat out at you so clinically and beautifully from your car audio is both glorious and painful. "You can look back but don't stare". And suddenly staring is all you are capable of. Gentle, caressing, melancholy, seductive, beautiful. I don't know if I'll ever love this CD; but this song - oh yes; and it will haunt me for a while. It's a piece in the Telegraph reporting on an American survey that says religious people are "nicer" - and they don't mind which religion, though they basically talk about Christians and Jews, with a couple of Moslem references thrown in for good measure. The basic idea is that religious people care more in society, give more time for needy people, and give more money to charitable causes - be they faith-based or secular, it doesn't matter. Society wouldn't work without this going on. After the article is a whole host of comments from angry people saying why religious people are not what they appear, and why this article is wrong, and why you shouldn't take a penny from these nutcases. I'm sorry, but the nutcases don't appear to be the religious people, but the very angry non-religious people that tend to write comments after such articles! Oops. I said that out loud didn't I? Well, on twitter, of course, you are commenting to the world, though really, who reads this stuff? Your 62 followers perhaps. No-one else, surely. It's not that there she doesn't have a point about those who, in the name of various religions, have been and are very cruel indeed. You can't gainsay that. It's the total sweeping away of lives of service and kindness and goodness in that first half sentence. Religious people "might" be nice, which is defined as "giving a few bucks to the poor". And that's not what this article limits their (our) lives to. But somehow, credit cannot be given. We have to be belittled. The liberal secularist cannot cope with being shamed - totally shamed - by the faith communities here. They talk of goodness and caring for society. But we people of faith actually get out and do it. And so we should. We believe in a God who loves people, so we get out there and make a difference to the lives of those in need. If we didn't, we'd be the fakes the liberal secularists so badly need us to be. For me the most encouraging part of the article, however is this: religious people apparently make no distinction in their giving of time and money between religious and secular causes. They support the local hospital, school or arts foundation as much as their missionary societies. We will not be boxed, silenced, pigeon-holed and put away in a corner. The world runs better because of genuine people of faith helping their neighbours. And sure, you can always produce extremists we'd all rather be without, but take us ordinary faithful people away - and ordinary life would struggle to go on. We do not just care for our own - because (and I can only speak from a Christian perspective here) we believe in a God who loves everyone, including those who write nasty comments about good people trying to make a positive difference, and believing in that kind of God makes us the kind of people who also love everyone, regardless. And I get that's an ideal, and ideals get tested. But look at these statistics. Sometimes the ideals actually work. It was a beautifully sunny morning, in the way that the autumn sun can pull the remnants of last night's rain off the road and provide brightness without a hint of warmth. I drove along the M4, up the M5 and Gloucester-wards. A year ago today I was driving south after a couple of days at my mum's, listening to two new CDs and David Tennant on the radio. Rob Graham was driving north, taking his kids to see their grandma for her birthday. I made it home safely, having the luxury of an early start to avoid a bad weather forecast. Rob, my old friend, well, we buried him a fortnight later. I am who I am, and for all sorts of reasons am the kind of person who doesn't wear emotions on my sleeve. But were it my funeral tomorrow, I would not want "achievements" mulled over and rehearsed for all to consider; it's the friendships & relationships we are given and which we create that make life so rich. Today I stood at Rob's grave with his parents, George and Elaine, and then we went and had coffee together, and spoke of our year, of Rob, of the future, of family and friends. I wish I could tell Rob how much he meant to me. Those of you who are my friends around the world, whom I see so seldom, please know you mean the world to me. Remembering is not done simply with tears and better intentions. It is done with lives and deeds. It is done with honour and the cherishing of memory so that the living we have is the better for the remembering. We recall not in order to wallow in nostalgia, but so that we may be better than we are, so that we might reach the standards we see in our better friends and that the days we are granted and they were not are not fallow but fecund with love and justice and goodness and kindness because for them not to be would mean we had simply forgotten. And I for one will not forget. I cannot. Here is a typical article from the Guardian about evangelicalism. Read it & come back to me. I'm guessing that if you recognise in it all sorts of things that cause you to question evangelicalism in the church today, you pretty generally have questions about this side of the church, or perhaps just read too much of the Guardian... And if you want to dismiss it out of hand, you are a staunch evangelical who can't take any criticism at all. I'd like to question some of this piece fairly robustly, but also push a few of its questions a little further. And I am a card-carrying evangelical - albeit one who always comes with his own critique of his own party, because I believe the Scriptures define the people of the book, not the party that would like to control the people of the book. She says there is no sacred symbol of any kind on display. Only a lectern and a Bible. Perhaps she has never been to Geneva either, where here too she might struggle with exactly the same kind of absence - or rather, presence - of exactly the same kind of symbolism. I'm afraid that (and she admits she has a Catholic experience) her own expectations are weighing heavily here. Pentecostal churches - and indeed most Protestant churches - simply don't use Catholic imagery; it doesn't make them unChristian or even unsymbolic. It makes them different. They are not going to use Catholic sacraments - it is simply not their tradition or theology, and to expect them to is to fail to respect them. As a writer she fails to see beneath the surface, and that's a pity; though (and here comes my first dig - I'm honest enough to point it out) in the Guardian, a certain kind of surface is all that is usually required. There is a criticism of church texts imported from Europe (in a Spanish speaking nation) but then criticism of contemporary local music and suggestions that Gregorian chant and European classical music should be included. I'm just saying - that's blatant hypocrisy. However, any thoughtful evangelical has to hear the words: "Evangelical Christianity has already opened wide its arms and its heart. I just hope that it will also open wide its mind" and know that here is a plea that we all desire to see fulfilled. Most of this paragraph contains words I can echo from my own heart (as I say, I think her last sentence perhaps misses the mark) and she repeatedly comments on the excellent work of this particular church in serving the poor, surely a mark of genuine discipleship, but asks that its teaching deepens further. All Bible teaching should seek to do this. That's not a request we fear, but one we all need to embrace. Likewise, in the following paragraph, she hits upon one of the current fault-lines of evangelicalism as she says "women are individual leaders as well as complementary partners". The Telegraph yesterday posted a report about an evangelical English bishop comparing supporters of ordaining women as bishops to Nazis. Hmmm. He needs to get a life - or at least start leading his life in the real world. The Jesus I follow treats people as people. A woman at a well leads her whole community to faith. A woman is the first witness to the resurrection. Women are human beings. This is essential theology, please. So I do not agree with the writer's conclusion that evangelical churches are a prelude to the church growing up! Goodness me, no. Though I do hope the evangelical church will continue to grow up. Hope & pray. For this is where I belong and want to continue to belong and want to draw others to belong too. It is a place of life and hope and glory - as long as it is a place where we are facing the life and hope and glory of Jesus. Here's a song I wrote in 1992. I was leading a worship band in St Aldate's Oxford at the time, and this song became one of the songs most requested of everything we did. It almost didn't make it. I played the song twice. Maybe three times. And dropped it. It wasn't working, I felt. Till a couple of months later, several different people started to ask me what had happened to the "Wait on God" song - they had really loved it, really found it help them worship God. And I was genuinely surprised. More than surprised. So the song I had pensioned off in early summer got a second outing in the autumn - and this time it flew. Rising on eagle's wings. It has stayed with me ever since, in several formats, including a full band recording with that first band, the Groove Heroes at St Aldates, a couple of different choir arrangements, and it subsequently entered the worship vocabulary of both St Mike's Aberystwyth & St Catherine's here in Pontypridd. This video was filmed a couple of days ago by Matt Truelove, who has been doing a college project and wanted some music from me as part of it; kindly he sent me the full version of this in return for helping him out. Thanks Matt! And all these years after writing the song, such a simple piece still has the power to make my heart sing, to draw me to Jesus, to lift me in worship. I'd have lost these words & music ages ago if it wasn't for those folk who'd pushed me and insisted I gave it another go. I can't remember who you were - but thank you too!